Geraint Jones of GJ Locks takes us through a strict drill on how to open locks through the timeless art of drilling. Drilling mortice locks has always been frowned upon by most, described as ‘The Cowboy’ method or what an unskilled locksmith would do. Despite what the keyboard warriors on the many locksmith social media groups might have you think, it is how most of us started. But if you learn how to do it properly, you will soon see that it is a skill worth taking more seriously. 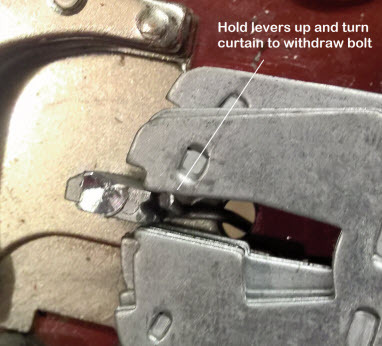 You can’t pick or decode a lock with an exploded case – or the many other types of common failures. You might not have the cash to invest in decoders or other lock specific tools. So what else can you do? To start with you must be confident in your lock ID. So taking what information you can from looking in the keyhole and by consulting one of the many ID manuals out there you will now know what lock you’re dealing with. I have found it best to make my own drill point charts by practising on old or new locks. Taking photos of the inside of the lock lever and bolt side. Take the levers out to see where your hole should come through the case if drilling on the bolt side. Having this visual information to hand will help you when you are struggling to make out what you can see through the little hole. If you drill a mortice lock and use the same drill bit from start to finish you are treading a thin line on making the job easy or a massive pain in the backside. • Drill bits are pointy (no surprise there). • You need a sharp carbide drill bit to cut through the locks hard plate protection (obviously). 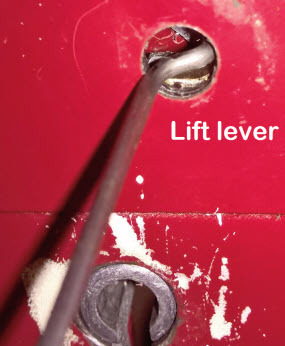 • The levers or the bolt (depending on what side of the door you are) are tight up against the case your pointy drill bit is cutting through. 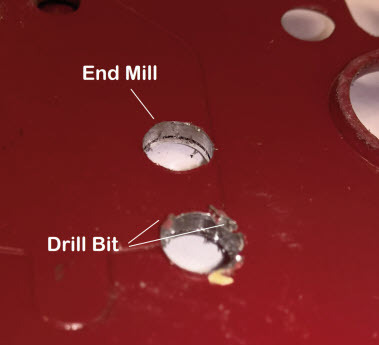 • The tip of the drill bit pierces the case but you need to open the hole up to see what’s going on. Now, as you keep drilling, the tip of the drill is chewing into the first lever or the bolt. • Levers are thin and can bend or deform with the slightest sideways pressure. 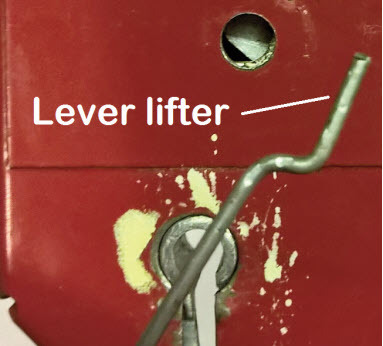 Some locks have wafer thin spacers which are even easier to damage. And let’s not forget about the burrs left behind by your drill bit. These alone can often be enough to stop levers from lifting, or bolts from moving back. We’ve all been there. An easy solution to this problem is the use of a carbide end mill. Use your pointy drill bit to cut through the hard plate but then stop. 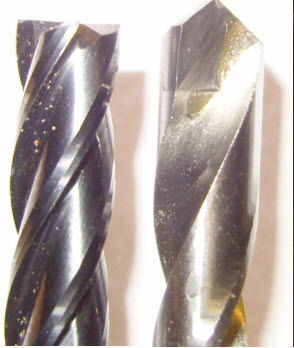 Swap to an end mill and neatly finish the hole off. No damage to the lock internals. No burrs on the inside of the case to worry about. Simple as that. Now insert a cut down key and lift the levers that are running nice and smooth. Poke your wire into the hole to hold the pack at the gate and effortlessly withdraw the bolt. If the lock is bolt side don’t always assume you need to drill through the bolt. 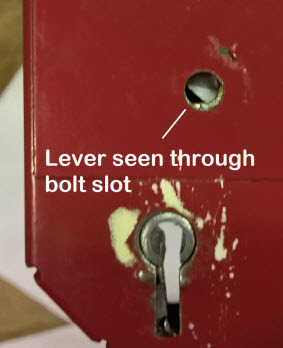 A lot of locks have a slot cut out of the bolt. This might not be right next to the stump but it is the same height as the stump. Insert a bent bit of wire to go around the bolt and lift up the levers. Do your research, make your own drill charts, practice and you will no longer be worrying about opening a mortice lock using a hole saw because you’ve mashed up the insides with your pointy drill bit.